Marc & Sara Schiller founded Wooster Collective in 2001, a website that celebrates and plays a crucial role in documenting otherwise ephemeral street art. 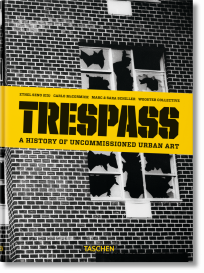 Based in New York City, the collective curated most of the contemporary images in Trespass. Its "Wooster On Paper" series presents the work of international artists in limited edition books.